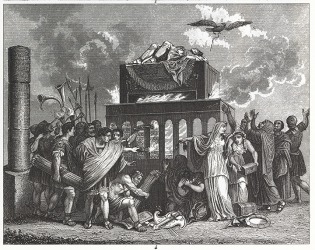 An illustration of a Roman Emperor funeral pyre. An example of a pyre is what the Nazis used for burning the bodies of dead Jewish people during the Holocaust. "pyre." YourDictionary, n.d. Web. 24 April 2019. <https://www.yourdictionary.com/PYRE>. A heap of combustibles for burning a corpse as a funeral rite. Latin pyra from Greek purā from pūr fire ; see paəw&rlowring; in Indo-European roots. Latin pyra (“pyre, funeral pile"), from Ancient Greek Ï€Ï…ÏÎ¬ (pura), from Ï€á¿¦Ï (pÅ«r, “fire"), from Proto-Indo-European *pÃ©hâ‚‚ur. Etymological twin to fire. Then the pyre was built and the body laid upon it. "Build a pyre here," Damian whispered at last. A pyre had been built in the middle of the cobblestone courtyard to burn the bodies of the demons before nightfall, when they.d come back alive. Snow fell from the sky to be either burned by the pyre or to cover the red mess that was the rest of the park.